New Delhi: A Superintendent of Service Tax Commissionerate at Nehru Place in the capital, who was arrested yesterday by the Central Bureau of Investigation (CBI) for demanding and accepting a bribe of Rs.1,50,000 from a tour and travel operator, was produced today before the Special Judge, Patiala House Courts. 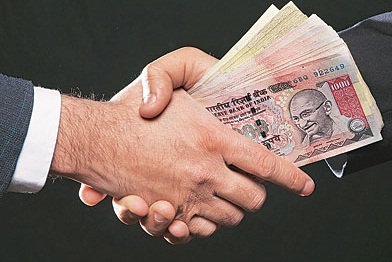 A case was registered under Section 7 of Prevention of Corruption Act, 1988 on the allegations that the Superintendent of Service Tax Commissionerate at Nehru Place in the capital was demanding a bribe of Rs.2,50,000 from a complainant for not raising a demand for service tax liability in respect of his tour and travel company. CBI laid a trap and the accused was caught red-handed while accepting the bribe of Rs.1,50,000 from the complainant. Searches were conducted at the office and residential premises of the accused which led to recovery of FDRs of Rs.35,00,000 and documents of immovable properties at Dwarka & Rajendra Place in Delhi. The arrested accused was produced today before the Special Judge, Patiala House Courts here.